Critical Focus by Paul Richards, PhD contains the photographs of Harvey Wilson Richards and text of the original book. It also accommodates a much wider selection of Harvey Richards’ still photography which is available on the internet through the Harvey Richards Media Archive and Estuary Press. End notes give readers the opportunity to explore the Harvey Richards Media Archive by subject. Within the book itself, a new List of Photographs offers instant access to any photo in the eBook. The 120 photographs in Critical Focus were the first to be published back in 1986. Today, over 1000 photos are available on the web on the Harvey Richards Media Archive. This book, in four sections, namely California Farm Workers, Peace and Civil Rights Movements, Forestry and the Environment and Miscellaneous, covers his journey as a photographer from 1958 to 1978. 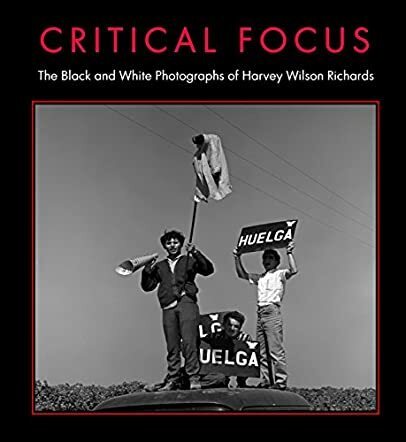 Critical Focus by Paul Richards, PhD is an album of Harvey Wilson Richards' photographic work covering many subjects including farm labor, the civil rights movement, and the peace and anti-war protests. Poignant pictures illustrating varied but socially relevant topics, such as working and living conditions in California agriculture, the wasteful and largely hidden deforestation occurring in California, Oregon and elsewhere in the U.S., racism in hiring practices, southern bombings of black churches, the U.S. blockade of revolutionary Cuba, atom bomb testing and the Vietnam war are included in this collection. Each and every photograph speaks volumes about the rather hazy and grey chapters of US history of the bygone days, over and above the proof they are of the professional competence and artistic ebullience of the lensman in Harvey Wilson Richards.